Foundations built ahead of schedule by the Hoa Binh Construction & Real Estate Corporation. Construction of the second apartment project developed by Gamuda Land Vietnam in Hanoi has piqued the interest of other investors and customers recently. Located at the heart of the Best Residential Development in Hanoi, Gamuda Gardens, The TWO Residence is the perfect choice for families looking for high-end apartments with integrated amenities at an affordable price. Forming an L-shaped block with 27- and 30-level towers, from one-bedroom studios to three-bedroom apartments, The TWO Residence is designed to capitalize on natural lighting and ventilation. Residents can also enjoy a wide range of internal facilities, including a shopping center, three parking levels, a landscaped garden with a children’s fun pool and playground on the fifth floor, and a sky garden on the 27th floor. Residents can also enjoy panoramic views over the Red River from the 27th floor. The TWO Central, a vibrant chain of shop houses surrounding The TWO Residence, provides a variety of quality services such as restaurants, coffee shops, supermarkets, and offices. With the aim of providing residents with fully-integrated apartments within a reasonable timeframe, the decision to choose a reputable contractor was taken very seriously by the developer. For the construction of The TWO Residence, Gamuda Land Vietnam put their trust in the Hoa Binh Construction & Real Estate Corporation, one of the most prestigious companies in the field both nationally and internationally. Hoa Binh is the only national construction company to be awarded the title of “Vietnam Value” four years in a row, starting from its first year in 2008. It was also one of the Top 50 Vietnamese brands in 2015, as evaluated by Brand Finance magazine in the UK. Hoa Binh has also been a pioneer in the application of advanced technology, international quality, and environment management systems, such as ISO 9001:2008, ISO 14001:2004, and OHSAS 18001:2007. Hoa Binh has demonstrated its capabilities by showcasing its own technical knowledge and modern management methods, including the “design & build” method as well as the BIM (Building Information Model) solution, the latest project management tool and in which Hoa Binh is at the forefront in applying. Safety and quality are ensured throughout the construction process and follow international standards. In addition to The TWO Residence, Hoa Binh is also in the process of developing many other large-scale projects, such as VietinBank Tower (Hanoi), Sheraton Da Nang, Saigon Centre, German House (Ho Chi Minh City), JW Marriott Emerald Bay Resort & Spa, and Premier Village Phu Quoc Resort (Phu Quoc Island), among others. Officially starting construction of The TWO Residence on March 14, 2016, with the utmost devotion and high regard for reputation and quality Hoa Binh completed the foundations ahead of schedule, on June 28. This was the result of great support from Gamuda Land Vietnam and was immensely appreciated by future residents of The TWO Residence. 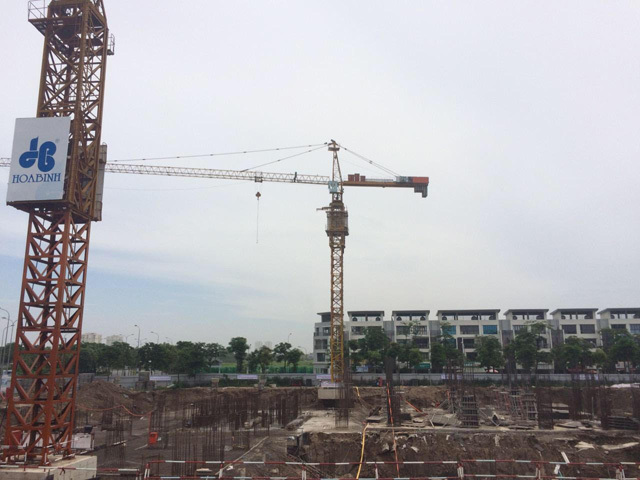 At a time when many handovers of real estate projects have been delayed, the timely construction progress at The TWO Residence further solidifies customer confidence in Gamuda Land Vietnam as a developer and their belief in the sustainable development of the Gamuda Gardens Township. With a vision of being the premier developer of prestigious lifestyle projects, Gamuda Land Vietnam is committed to building innovative and quality properties in order to further improve the creation of an integrated community.